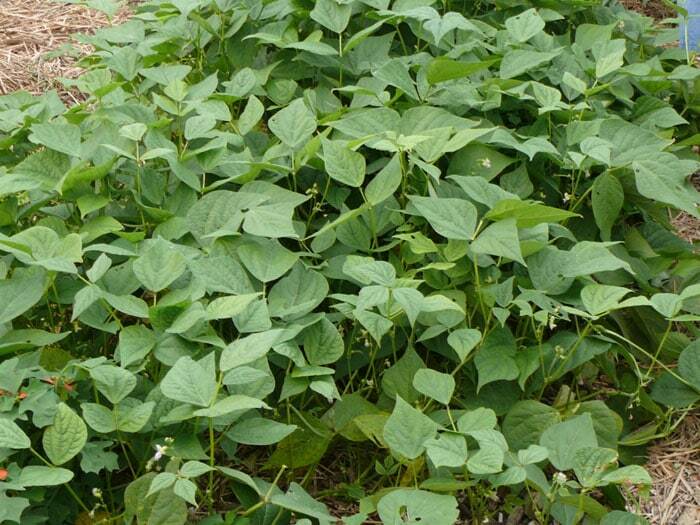 Green Beans – Great crop for late summer until frost. Green beans — also called string beans or snap beans. Tomatoes might head the list as the all time favorite vegetable, but green beans certainly come in second. Since there is nothing much on Tending My Garden about growing green beans, one of my readers wrote to me and asked why I didn’t grow them. Well – I do grow them. But my planting schedule for green beans is a bit different than what most folks follow. At the beginning of the growing season most of my garden space is taken up with onions, lettuces and other greens, peas, tomatoes, peppers, cukes, squash, and potatoes. Most of my allotted gardening time is taken up with planting, putting straw in the garden, checking for and killing squash bugs and potato beetles. And then there’s harvesting. I couldn’t handle one more thing at the beginning of the season. Over the years I’ve found green beans are much easier for me to deal with in late summer and fall. I have more space available in the garden. Time-consuming crops like blueberries and strawberries and peas are finished, so I have time to harvest green beans. I plant in the last half of June. And yes, of course I always run the risk of green beans not doing well because of drought, but when you plant any garden or any crops it’s all about risk and variables. Even this year we had a period of drought that lasted about 5 weeks and I thought the beans weren’t going to make it. Fortunately the rain came just in time to save them. Bottom line with planting is — if I don’t sow, I won’t harvest — so I plant. 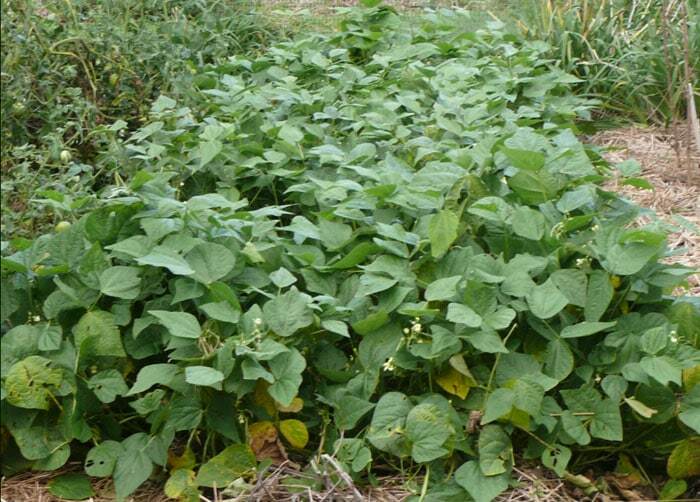 Provider Bush Beans – This young planting has not yet produced. Bush beans are my favorites. One year I planted pole beans and didn’t find them to my liking in any way. I have a friend who plants only pole beans and loves them. He would never plant bush beans. So it’s a matter of personal preference. And by the way – in case you’re wondering – the varieties I grow are Provider Bush Bean, Bush Blue Lake, Contender Bush Bean, and/or Masai Green Bush Beans. Masai is my very favorite. But June, July and early August plantings of Masai don’t do well for me, so I plant them at the end of August. Sometimes I miss planting in August and will take a chance on planting as late as September 1st, like I did this year. If the weather holds, I’ll be fine. If I have to I’ll use row covers if a frost is expected. Still a good chance of getting beans to maturity. Masai bean plants are a bit shorter, bushier, and can have a dozen long, straight, and tender green beans hanging at one time. They are the most beautiful and delicious bean I’ve ever had. 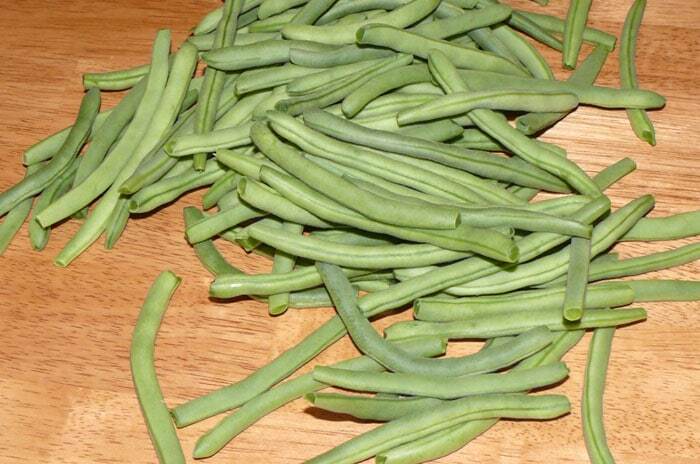 You can get the Masai green beans from Pine Tree Garden Seeds if you want to try them. To increase my chances of success and bounty, I put in 4 or 5 small plantings – about 3′ x 5′ every two weeks. This year the first planting was June 23, so I had a nice picking of beans towards the end of August. This one row of Provider Bush Beans is really two plantings. (The first was planted June 23.) As of September 4th both have been giving me beans for almost two weeks. By September, two rows were producing lots of beans for us to enjoy with every meal. The other earlier plantings have lots of blossoms and promises of many beans to come. Each planting should produce for about 3 weeks. If all goes as it appears, I’ll have beans until a freeze hits. I usually start harvesting when the beans are about 3 to 4 inches. I missed checking them for a few days this year and by the time I got out there to pick they were a bit larger than I like. Beans can become overgrown almost overnight. So it’s advantageous to harvest daily or at least every other day for best quality and taste. Also, the more you pick the more the plants will produce. If they do begin to bulge and get plump before you get to them, use them for soups. I blanched and froze a pint from my first picking that were like that. But they’ll be great this winter in soups. Green beans – ready to cook. Pick your green beans either after the dew dries in the AM or after the sun is low in the late afternoon. It’s stressful for the beans (or any vegetable) when you pick in the heat of the day — especially in high humidity and if temperatures are above 85 degrees or so. Stay out of your beans when the leaves are wet from rain or dew. Pathogens that cause disease can stick to your hands, clothing and tools and you can carry them from plant to plant. Pick your green beans when leaves are dry. Green beans are legumes and can pull nitrogen out of the atmosphere and “fix” it in the soil. Your next crop in the same garden bed will enjoy the benefits of having nitrogen available for use. If you’ve planted peas or green beans in a garden bed, use different beds for peas or green beans for the next two years. If you have more to do at the beginning of the season than you can handle, but love green beans like I do ——- try my planting schedule. I thinking you’ll really enjoy having this taste of summer to spice up your fall meals and garden. Hey Theresa, I planted bush and pole beans this year and it’s a good thing I planted the pole beans. Rabbits ate all the bush beans.Next year I’ll fence in the bush beans inside the fenced in garden. I can sure relate to your rabbit problem, Don. Years ago — maybe 20 — I had coexisted with rabbits in the garden with no problem. One morning I went out to pick the most beautiful bush beans I had ever grown and the every plant was nipped off. That was the day Bill and I declared war on the rabbits. My garden now is fenced in a manner that they don’t get in. Although it’s not impossible for them to get in — it’s improbable. We have buried into the ground so they can’t dig under. Three young ones got in about 12 years ago after we put the fence up. I thought we’d never catch them. Glad you had the pole beans! Do you use inoculant when you plant beans? I’ve bought a package for the last couple of years, then life intervened and I never got any beans planted. What are your thoughts on inoculants? Thanks! According to what I read online (and you probably have read it also) the cultures of beneficial bacteria for treating legume seeds prior to planting encourages formation of the nodules on plant roots. Supposedly this makes for richer soil, bigger plants and better yields. I’ve seen it claimed that the nodes on legume roots will be used up by the plant rather than incorporated into the soil if you don’t use the inoculant. Back when I first started gardening and for many years thereafter, I was luck to be able to buy the bean seeds. And although the inoculants are not expensive — for me it was either the beans or the inoculant. I couldn’t get both. So I didn’t. I worried about it for years. Then I got so I could afford to buy the inoculant. But I didn’t. I figured if it ain’t broke — don’t fix it. I think in most of my beds I have very good microbe activity (soil life) and I’m working on making it even better with cover crops. I don’t feel inclined to buy the inoculants. But they can’t hurt if you chose to use them. I always had and still have rich soil, big plants and great yields. P.S. By the way — those inoculants have a shelf life of 6 months to year. Scatter the outdated stuff in your garden rather than throw it out. Couldn’t hurt. Specially for us folks with small gardening spaces where space is a premium, planting green beans later in mid summer is a GREAT tip, Theresa. After I took out my peas(left the roots in as per your suggestion) I replaced it with pole beans and while I’m waiting for them to grow, we are enjoying the bush beans. And, I am growing my beans, zucchini, cucumber all from seed for the first time! Truly easy-peasy(pun intended ) – as in your words :-). So glad you could use the tip Aparna! And I am soooooooo proud of you for all you are doing and accomplishing!